﻿ WRC Rallye Monte-Carlo 2019 - Sébastien Ogier Vs Sébastien Loeb - Comparison, Flatout & Max Attack! WRC Rallye Monte-Carlo 2019 - Sébastien Ogier Vs Sébastien Loeb - Comparison, Flatout & Max Attack! 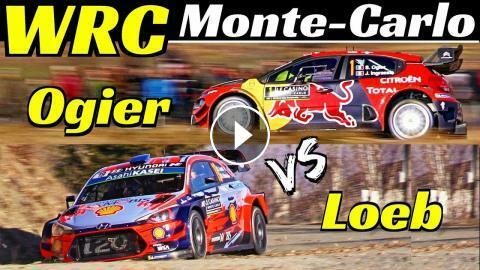 Finally, the WRC 2019 started with the Monte Carlo Rally, we are near Gap, in the French Alps and this is the video about Sèbastien Ogier Vs Sèbastien Loeb with the videos taken during the special stages I've followed. Epic Flatouts, Max Attack, Action & Pure Sound! Citroen C3 WRC Plus vs Hyundai i20 WRC Plus. The rally saw Ogier's victory of just 2.2 seconds from Neuville, a gap was so low that he had not seen for 40 years and the lowest ever in the history of rallies. In the final classification of the Rally, the crew LOEB/ELENA reached the Fourth place overall. Colin McRae Tribute & Champions Parade + Show at RallyLegend 2017 - Loeb, Solberg, Ogier & More! RallyLegend 2017 Sunday' Show & Burnouts w/ Sébastien Loeb, Thierry Neuville & More!